April 21st is a very important day. It’s the day that Google is launching mobile changes to their ranking algorithm for searches on mobile devices. According to Google, you are either mobile-friendly or not and those websites that are not mobile friendly by the deadline could suffer a ranking decrease. Website owners have also been receiving messages through Google’s Webmaster Tools about mobile usability issues. If you have received one of these messages, you should be solving these usability errors before the new algorithm goes into effect. Google is also reportedly working on a mobile only version of the search index, which would separate the search results for people searching on smartphones from those searching on a desktop browser. Mobile has caused a major shift in buyer behavior. Regardless of whether the buyer is searching for a new set of headphones or a new product for their business, they are utilizing their mobile devices to search, learn about and buy these products and services. So the bottom line is if your website isn’t mobile friendly, your business may not be visible to those searching on their smartphone. And according to Google, mobile pages that provide a poor searcher experience can be demoted in rankings or displayed with a warning in mobile search results. 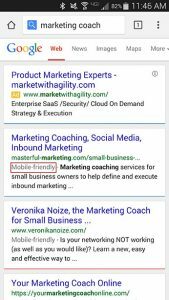 Do a search on your smartphone for your business name and see if the “mobile-friendly” label is shown next to your website listing in the results page. If it is not, it’s time to get to work on making your site mobile friendly. 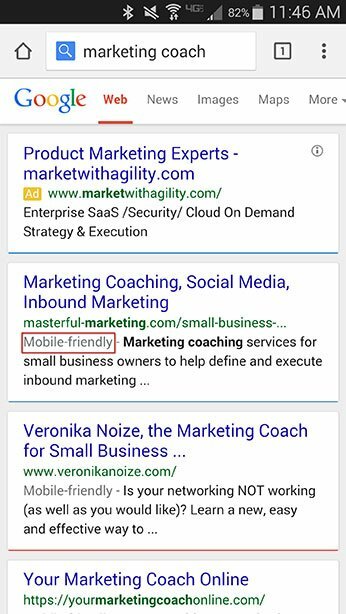 See Google’s Mobile Guide to mobile friendly websites. Everyone knows how prevalent smartphones and tablets are in our personal lives. But the impact of mobile is not just consumers using them for social media, checking email, searching or shopping. The B2B market is also seriously impacted by mobile usage increases. According to the IDG Global Mobile Survey 2014, 86% of executives use their tablet and 72% use their smartphone to conduct research for products or services for their business. 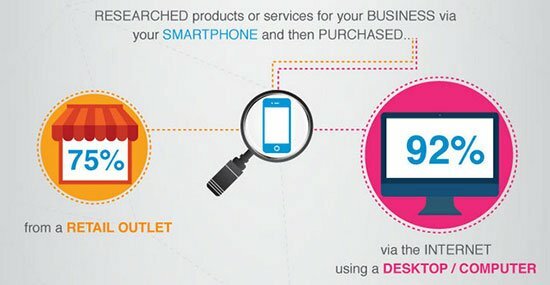 In addition, after they have done their research, 75% of these executives purchase from a retail outlet and 92% purchase the product or service via the Internet from their desktop computer. Does your website support mobile users? There are several ways to implement mobile device support for your website, but for most small businesses, implementing a responsive design is the easiest and most cost effective means to achieve this mobile friendly goal. Responsive design means that your website serves the same HTML code to all devices along with different CSS style rules to optimize the site’s interface across the varying devices. I absolutely love Woothemes Canvas as the framework to implement a responsive WordPress website. This highly customizable theme provides responsive design and a powerful framework that reduces the need for custom development. In addition, I recently discovered some powerful Canvas extensions from Pootlepress that have enabled me to implement some very different website designs that would have been much more difficult to implement. The deadline to make your website mobile friendly is fast approaching. Make this a top priority for your marketing so your business stays visible to your target audience. Will your website be mobile friendly by the April 21st deadline? Excellent post. One must have a blog mobile friendly. The use of mobiles are drastically increases with internet. And most of audience is through mobiles only. To optimise these audience/customers to convert them into sale.. mobile friendly site is very useful.